Have you ever wanted to read a novel while wrapped up in the warmth of a cuddly soft blanket? Frustrated with all those cheap fleece throws that only offer ugly wide sleeves and those silly, embarrassing patterns? 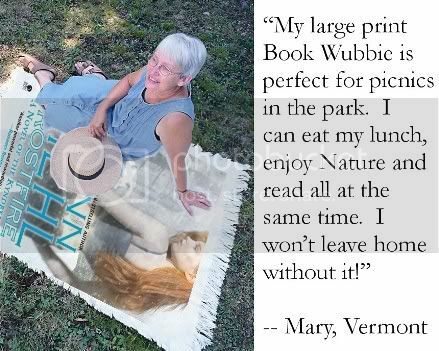 PBW Promo Enterprises has the solution for you: the Book Wubbie®, the very first blanket you can read! Yes, fiction lovers, our patented revolutionary micro-print process takes reading to the next level by combining the books you love with ultra-soft coziness to keep you comfortable and toasty while you read! Please don't be fooled by high-tech imitations! The Book Wubbie® is not a gadget, requires no batteries or cables, and comes complete and ready to enjoy right out of the box!. You never have to worry about connecting it to the internet to download your novel because the book is already part of the blanket! No gift says "I love you and I want you to read more" like the Book Wubbie®, which envelopes your loved ones in downy softness as protection against chilly nights while alleviating their boredom by providing a wonderful book to read that they don't have to hunt around the house for, go to the library to check out or borrow from a friend! 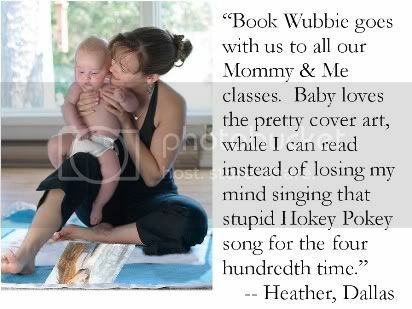 Yes, the Book Wubbie® is truly the most incredible gift for both the mind and the body! Thanks to the durability and practicality of our amazing micro-print process, the Book Wubbie® is machine washable, folds flat and can be conveniently stored in its box on your book shelf just like any paper book! No DRM to worry about, so you can also lend your Book Wubbie® to friends without a hassle. Take it along on vacations, road trips and sleepovers -- it's ideal to snuggle up with it while you're out camping and can't get to a book store! The Book Wubbie® is the perfect carry-on for long airline trips, too! Don't miss this wonderful opportunity to experience the ultimate in comfort and entertainment; buy your very own Book Wubbie® today for just three easy payments of $19.95. Hurry and call our operators now before your favorite novel blanket goes out of print! I can't find a link to them, but have you seen the layered blanket where each layer is a page in a fairytale book? That's what I thought this was about at first :). ROFLMAO. Priceless! I love it! Wow...what type of substance did you get into? And yet...I would totally buy this!!! I love it! Are the Short Story Slippers available with modern stories or just classics? Wow, very cool idea! :) I also love the Frostfire covers haha. I love the idea and am sitting here thinking of which book cover would fit each mood and situation. That's giving the old grey cells a good workout. I think a scary one for a bad mood, a weapon wielding muscled hunky one when feeling combative and a soft romantic one when feeling all mushy. Thanks for that I'm fully awake now ( probably from thinking about all those muscles). Thank you for brightening up my Wednesday.